Surging Cali rockers learn how to deliver big messages and a bigger sound. Then leave it to others to treat Young the Giant with more reverence. Earlier this year, “My Body” charted at No. 5 on Billboard’s Alternative Rock singles chart and the band performed the song on Jimmy Kimmel Live. They’ll spend the summer on a headline tour of Europe (returning for Stateside gigs at the Sasquatch and Lollapalooza festivals) and be back home for a U.S. jaunt in the fall–not bad considering the L.A. quintet has existed in its current form for less than two years. He learned his lessons well. 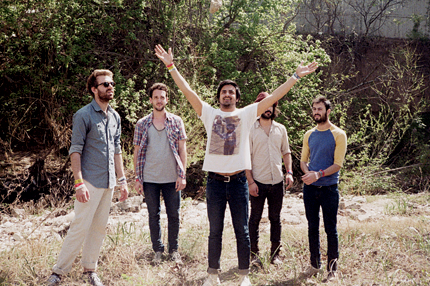 Released in January, Young the Giant (Roadrunner) serves up a dozen soaring anthems, from the antiwar lament “Garands” to the messiah-complex theatrics of “I Got.” The passionate material drew the attention of the album’s eventual producer Joe Chiccarelli (My Morning Jacket, the Shins), who sought to capture the power of the band’s booming live show after catching them at L.A.’s famed Viper Room. Thus, the debut was recorded completely live in the studio. “The dynamic we’ve forged together is so strong,” Gadhia says of that decision. “We just wanted it to keep going for as long as we can.” Nothing ridiculous about that. Read the entire June 2011 issue of SPIN, available now for iPad.